H and I had lunch yesterday with my good friend Kathy, a music journalist who is just so fierce–I’ll be posting more about her in the new year when she starts popping up on my television regularly. We ate at Spuntino, home of the supremely yummy small plates and burgers and truffle fries. She told me I’d “finally” posted another recipe (that baked ziti). Her devotion to this little blog of mine earns her all of the hugs and a quilt that I just delivered. More on that later. 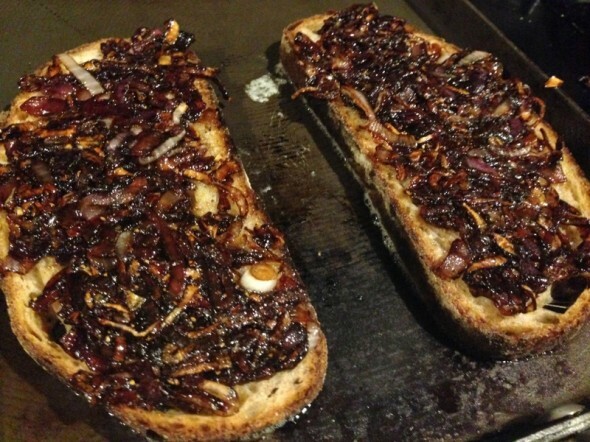 In the meantime, here is another recipe. I fully believe in giving the person what they want…or something? 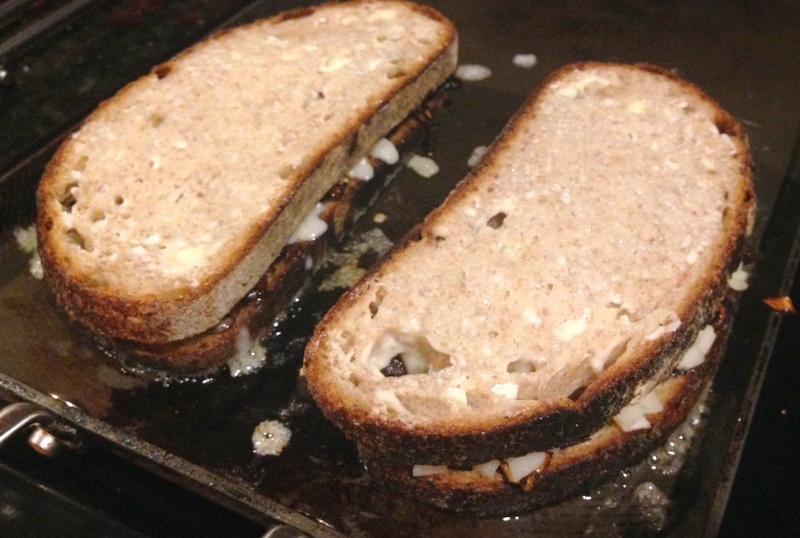 So…there’s no shortage of grilled cheese recipes out there, but Smitten Kitchen’s Emmentaler on Rye with Sweet and Sour Red Onions is so worth a try. 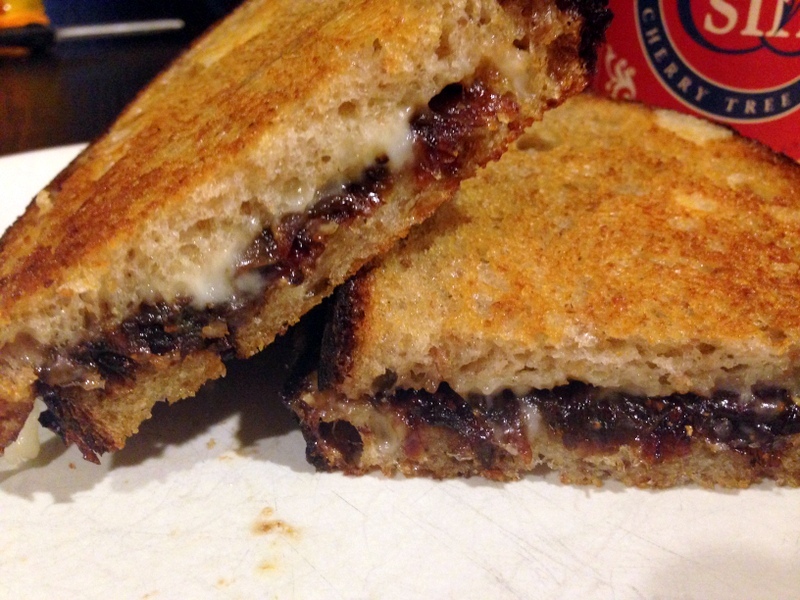 It’s just…so many nice flavors in one gooey, marvelous sandwich. I want one right now, and its not even 8am. 3/4 cup grated Emmentaler (or other Swiss cheese) **I ended up dicing sliced Swiss cheese the first time I made these…no Emmentaler in the store that day. Still worked. Make the onions. Heat the olive oil and 1 tablespoon butter in a large skillet over medium-high heat. 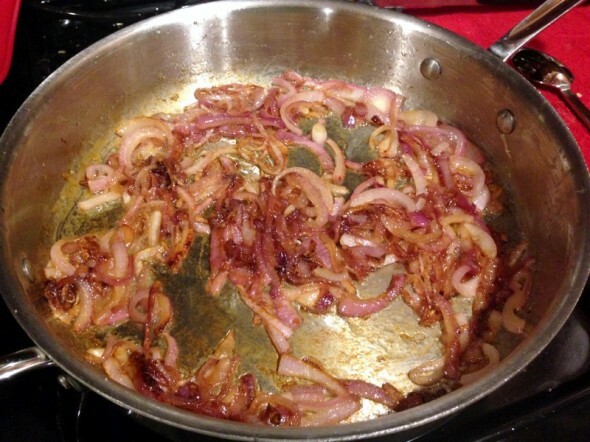 Add the onion and saute for 5 minutes. Add the brown sugar and salt, lower the heat to medium-low, and cook another 10 minutes. Stir occasionally. Add the vinegar and scrape up any bits. Simmer 1-2 minutes until the mixture thickens and season to taste with pepper. Cool to lukewarm or store in an airtight container in the fridge for up to 5 days. (Should be just shy of 1/2 cup cooked onions). Butter one side of each piece of bread. Arrange one slice, buttered side down, on a plate or board. Spread with a thick layer of the “jammy onions” (about 2 Tbsp per sandwich). Sprinkle with half the grated cheese. 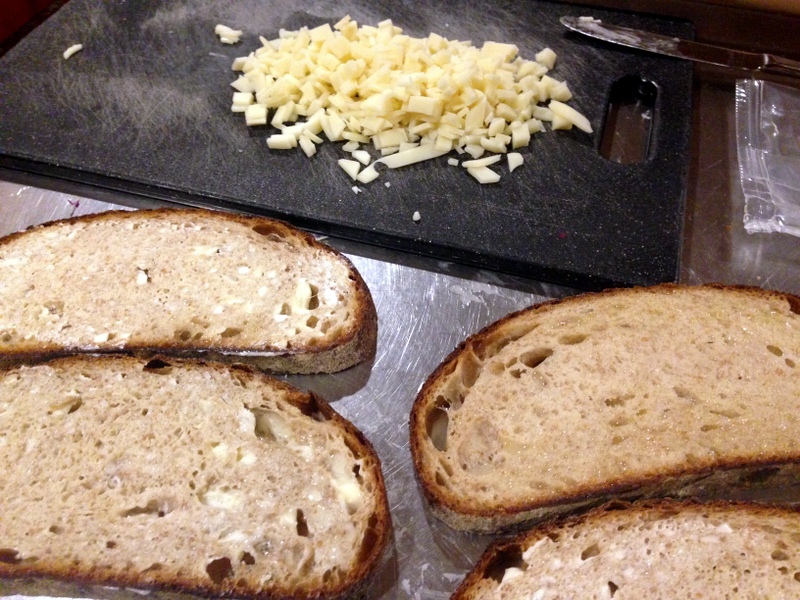 Arrange a second slice of bread on top of the cheese, buttered side up. Repeat to make another sandwich. Heat a 12″ skillet over medium-high heat. When it’s hot, arrange the sandwiches in the pan. Cook until crisp and deep golden brown (5 minutes per side). Slice in half and serve.